Filmed in a film noir atmosphere and featuring Henry Mancini music (lyrics by Livingston & Evans) that could tell you the action with your eyes closed, Peter Gunn worked in style. Known as Pete to his friends and simply as Gunn to his enemies, he did his job in a calm cool way. He got his tips and cautions from Lieutenant Jacoby, a coffee drinking pal from the police. Also providing tips was “Mother” of her self-titled nightclub. Working at the nightclub as a singer was Edie Hart, his girlfriend. The title character, played by Craig Stevens, is a well-dressed private investigator whose hair is always in place and who loves cool jazz. 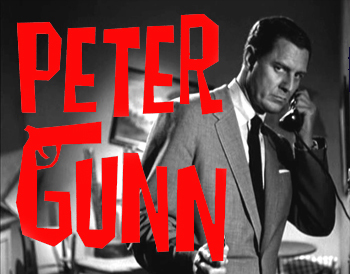 Where other gumshoes might be coarse, Peter Gunn is a sophisticate with expensive tastes. He operates in a nameless, fictional riverfront city and can usually be found at Mother’s, a smoky wharfside jazz club that he uses as his “office”, often meeting clients there. Pete’s standard fee is $1,000. He has a reputation of being one of the best investigators and trustworthy. He sometimes works cases out of the state and on at least one occasion out of country, with one case occurring in Mexico and another involving a tour of Western Europe.